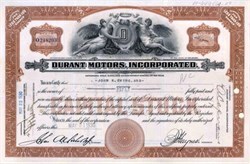 Beautifully engraved certificate from the Durant Motors, Incorporated issued in 1930. This historic document was printed by the American Banknote Company and has an ornate border around it with a vignette of an allegorical man and woman by the company logo. This item has the printed signatures of the Company’s President and Secretary and is over 72 years old. The Company was founded by William C. Durant, (1861-1947): The founder of General Motors Corporation. Durant began his career with a horse-drawn carriage company in 1886 and took over Buick in 1904, forming the General Motors (GM) Company in 1908. He lost control in 1910 to Chevrolet but regained ownership in 1915. He was forced out for good in 1920 and founded his own company, Durant Motors, Inc., in 1921.